It’s almost time for the inaugural conference of The Albert M. Greenfield Digital Center for the History of Women’s Education! 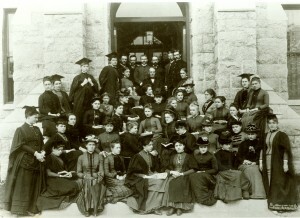 Women’s History in the Digital World offers a packed schedule of digital humanities projects that focus on women’s history. 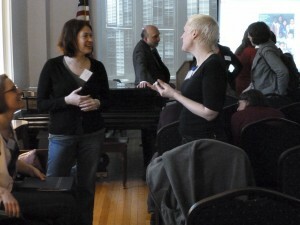 Participants are coming from across the US and the world to showcase their work, share information on tools, research, funding and practices, and most of all, meet each other in an environment wholly dedicated to women’s history issues in the digital era. 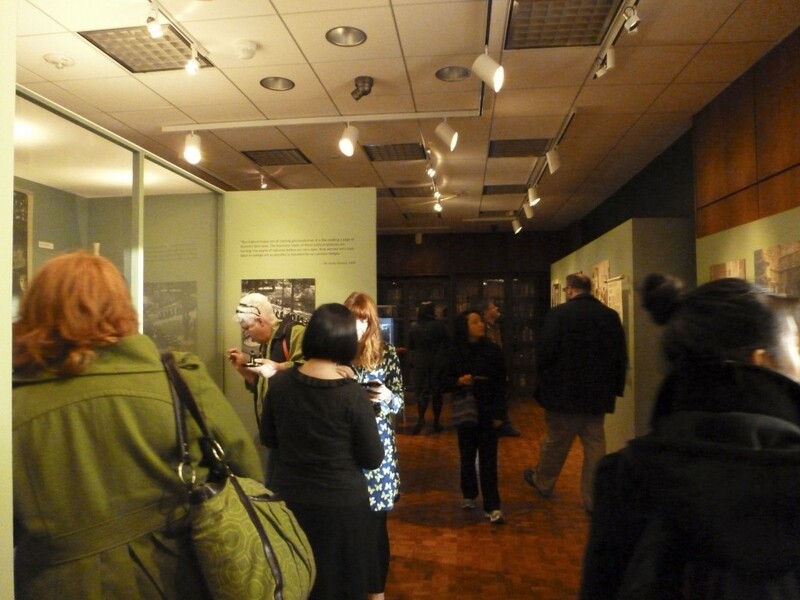 Members of The Albert M. Greenfield Digital Center for the History of Women’s Education and its Advisory Board members will be in attendance to inform you about our work and our future plans. 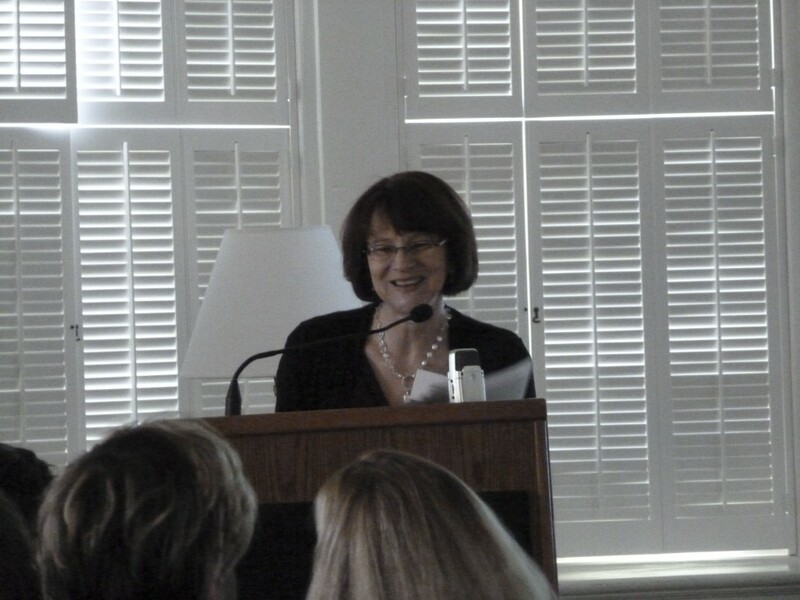 Our keynote speaker, Laura Mandell is Director of the Initiative for Digital Humanities, Media, and Culture and Professor of English at Texas A&M University. She is the author of Misogynous Economies: The Business of Literature in Eighteenth-Century Britain (1999), a Longman Cultural Edition of The Castle of Otranto and Man of Feeling, and numerous articles primarily about eighteenth-century women writers, and Breaking the Book (forthcoming). 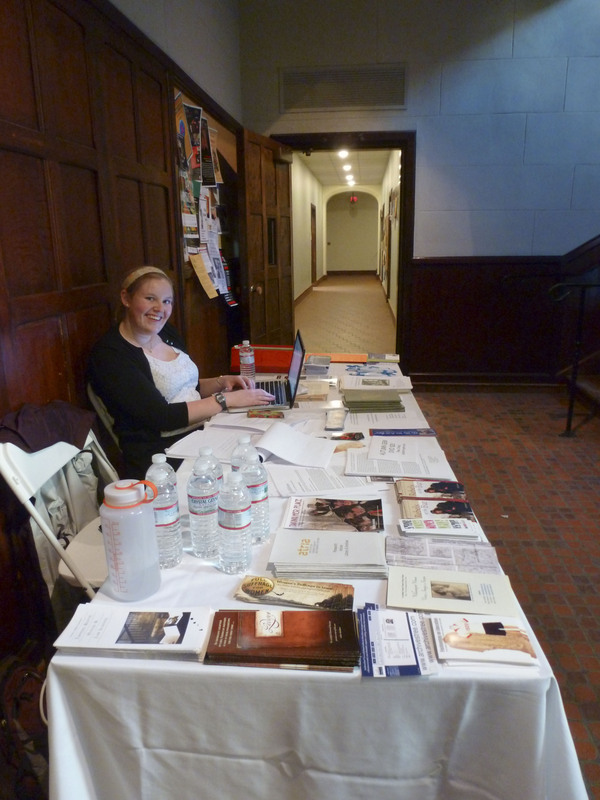 She is Editor of the Poetess Archive, on online scholarly edition and database of women poets, 1750-1900, Director of 18thConnect, and Director of ARC, the Advanced Research Consortium overseeing NINES, 18thConnect, and MESA. Professor Mandell will speak on ‘Feminist Critique vs. Feminist Production in Digital Humanities’. Registration is open and you must register online if you are planning to attend the conference by going to the registration page of the official conference website. It’s not too late to register! Registration fee is just $30 and this gives you access to the full conference, including the keynote and reception on Friday, all panels, coffee breaks and lunch on Saturday and a special closing reception at the gallery in Canaday Library to see Taking Her Place, a show curated by The Albert M. Greenfield Digital Center for the History of Women’s Education. 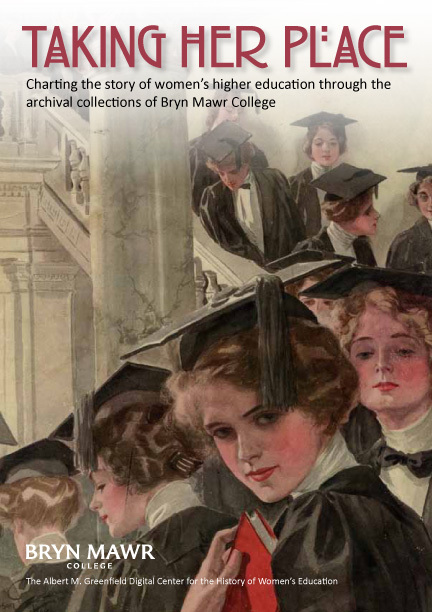 This will give conference attendees a final chance to engage with each other, view the collections of Bryn Mawr College, and wind down after a productive and fruitful gathering. Don’t forget that, as advertised on the official conference website, we are also offering a free tour of campus at 3.30pm on Friday March 22nd before the conference begins. If you would like to attend the tour, please email greenfieldhwe@brynmwar.edu with ‘RSVP Tour’ in the subject line of the email. Presenters at the conference are offered the ability to upload their presentations and related material to our institutional digital repository so they can be shared afterwards. Come join us – we look forward to seeing you! 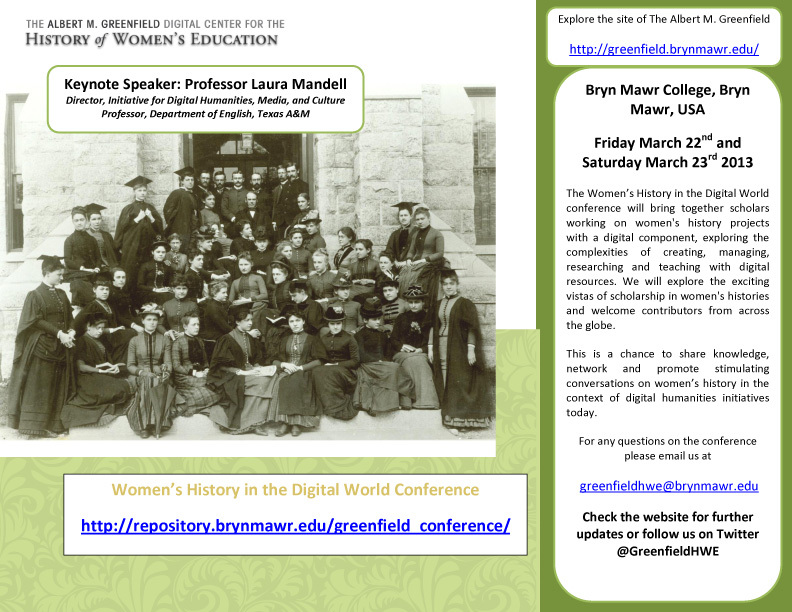 Registration continues for the Women’s History in the Digital World Conference, March 22nd -23rd 2013. 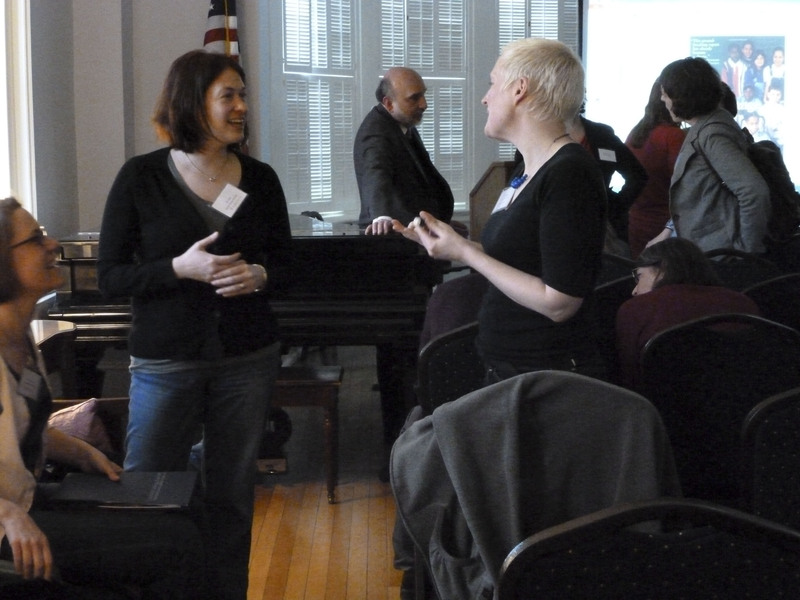 The conference brings together scholars, archivists, technologists, librarians, graduate students and those involved in the arts, heritage and cultural sectors to discuss their work on women’s history in the new realm of the digital world of research and teaching. Our keynote speaker on March 22rd, Professor Laura Mandell is Director of the Initiative for Digital Humanities, Media, and Culture and Professor of English at Texas A&M University. She will speak on ‘Feminist Critique vs. Feminist Production in Digital Humanities’ at 5.30pm in Wyndham and will be followed by a reception, also at Wyndham. Consecutive panels and a roundtable, featuring over 50 speakers, will happen on Saturday March 23rd. We have developed a separate conference website where you can find directions to the campus, the registration form and the full conference schedule. This site also acts as a repository for conference related materials after the event, so if you can’t make it be sure to check back for copies of the presentations you missed. Registration is completed online, with the $30 registration fee to be forwarded separately via check. Please email greenfieldhwe@brynmawr.edu if you have any questions.